This review first appeared in the April 19, 1996 issue of the North County Times. 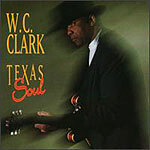 W.C. Clark plays Texas blues but with a touch of Southern soul. The veteran bluesman's second nationally released album, "Texas Soul," has as much Stax influence as T-Bone Walker. Clark plays tastefully restrained guitar; he's closer to the original Texas sound of Walker's jazz-inflected sophistication than Albert Collins' or Steve Ray Vaughan's fret-burning fire. Clark is also an outstanding singer  equal parts smooth and smart. In fact, he sounds remarkably like the great Johnnie Taylor. His musical selectino, both the covers and his original songs, could have come right out of the old Stax studio. And his reading of Willie Nelson's "Funny How Time Slips Away" is riveting. What is most striking about this album is Clark's absolute mastery of his guitar, his voice and his material. It is this sense of easy confidence, this marked professionalism, that makes clark such a joy to whom to listen.